AGRIPPINA, according to tradition St. Agrippina was a maiden and member of the Roman nobility who was tortured and then either beheaded or scourged to death for being a Christian circa 262. 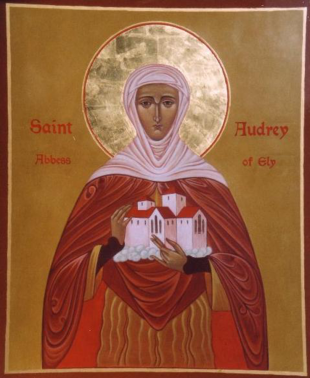 ETHELDREDA (AUDREY, ETHELDRED), St. Etheldreda (often known by the diminutive Audrey) was an East Anglian princess, a Northumbrian queen, and the founder and first Abbess of the double monastery at Ely in Cambridgeshire, England. The daughter of Anna, a Christian king of the East Angles, she was married while still young to a prince of the South Gyrvians, though she remained a virgin. Upon his death three years later, St. Etheldreda withdrew to the Isle of Ely in Cambridgeshire to live as a hermit. After five years, she was persuaded by her family to return to the world and marry Egfrith of Northumbria, but she refused to consummate this marriage as well, and after twelve years, St. Etheldreda obtained Egfrith's consent to become a nun. She received monastic tonsure from St. Wilfrid of York (12th October) at Coldingham circa 672 where her aunt St. Ebba the Elder (25th August) was Abbess. About a year later, St. Etheldreda founded the double monastery of Ely, serving as its Abbess until her repose in 679.
intercessor and protector for all. FELIX of SUTRI, a priest in Sutri in Tuscany during the reign of Emperor Valerian whose enthusiastic preaching and success in bringing people to Christ brought him to the attention of the authorities. St. Felix was arrested and was scourged to death (257). HIDULPHUS (HILDULPH), the husband of St. Agia (18th April), St. Hildulphus was a Count of Hainault in present-day Belgium, and courtier at the royal palace of Austrasia. He was also a co-founder of the Abbey of Saint-Pierre of Lobbes, and by mutual consent, SS. Agia and Hidulphus separated and entered monasteries, St. Agia entered an abbey in Mons and St. Hidulphus entered Lobbes. St. Hildulphus reposed circa 707. JAMES of TOUL, consecrated Bishop of Toul in eastern Gaul 756. St. James reposed at the tomb of St. Benignus (1st November) at Dijon while returning from a pilgrimage to Rome, 769. JOHN, a priest beheaded in Rome during the persecutions under Julian the Apostate, 362. MOELIAI (MOELRAY), St. Moeliai was baptised by St. Patrick (17th March) and later was the founded Abbot of Nendrum Monastery on Mahee Island in Strangford Lough, Co. Down, Ulster. He reposed circa 493. WALHERE, (Date Unknown), a priest in present-day Wallonia Belgium. St. Walhere was murdered by a fellow cleric whom he had chastised, and has been venerated as a martyr since.